CLEVELAND – It wasn’t quite Laettner to Hill, and it was at halftime and not the final horn, but there was a bit of much-needed road magic for the Thunder on Wednesday night. In-bounding the ball in front of the Cleveland Cavaliers’ bench, Steven Adams wound up and delivered his baseball-like dart to Paul George, and the Thunder’s perennial All-Star forward delivered the buzzer-beating strike with one quick, hard dribble to his left before burying a three-pointer and disappearing into a throng of adoring teammates on the sideline. George’s triple sent the Thunder into halftime up by 8, to that point the largest margin of the night and capping a 9-0 burst to end the half. After halftime, the Thunder jumped on the rebuilding Cavaliers again with an 8-0 spurt to push the lead out to 17. Everything seemed peachy, and like the Thunder’s first half shooting woes had gone away like the Cavaliers were on the verge of doing. That’s not quite what happened. Head Coach Billy Donovan’s club repeatedly got high quality shots, including 10 three-point attempts from Alex Abrines, but the ball just wouldn’t drop. Throughout the game there were some inconsistent stretches – a possession where the ball hit the paint and swung around for a wide-open shot then the next a no-pass dribble up long two jumper. For the night, the Thunder took 16 non-paint twos, leaving the door open for the Cavaliers to make their eventual 13-0 run to make it a contest down the stretch. Over the final 5 minutes, however, the Thunder didn’t take a single non-paint two-point jump shot. Everything was at the rim, from behind the three-point line or after a foul at the free throw line. 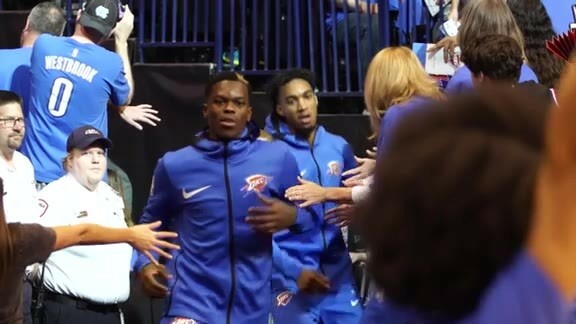 With the game tied at 84, George and Dennis Schröder, starting in place of Russell Westbrook who missed the game with a sprained ankle, led the Thunder on an 11-2 finishing run. The defense, as it had done all night, clamped down and contested all shots fired up by Kyle Korver, J.R. Smith and Jordan Clarkson. In the first half, the Cavaliers shot just 10-of-25 in the paint. Though Cleveland was much better around the rim in the second half, the Thunder still kept its opposition in check in crucial departments, like forcing 19 turnovers and 37.1 percent shooting along with allowing just 13 free throw attempts, making 13 steals, and blocking 9 shots. Teamwork makin’ the dream work. It took a complete team effort, and a gritty one at that to close out this victory. George scored 18 points to go with 7 rebounds, many of them coming as he hurtled his body into the lane on pick-and-roll switches to keep his body between the basket and Tristan Thompson. In the final three minutes, the Thunder allowed zero second chances. “We had a lot of energy and down the stretch we got rebounds. We didn’t give them any offensive rebounds and that was the key for the game,” noted Schröder. “You just gotta dig in, force them out and rely on the guys to come back and team rebound,” added George. 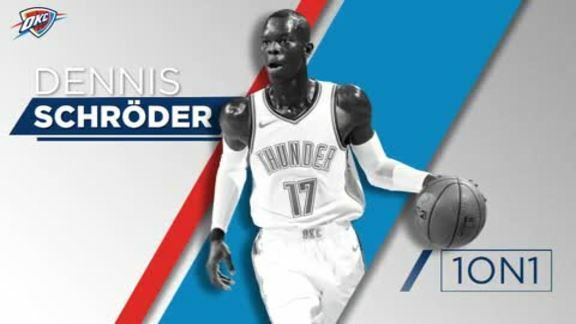 Despite shooting 7-of-27 from three and just 41.7 percent total on the other end, the Thunder got its offense by the aggressive, downhill drives of Schröder. The German flash scored a season-high 28 points on 11-of-19 shooting, with buckets coming in all sorts of creative ways – daring drives down the baseline, floaters in the paint and jump shots at the elbow. In a defensive struggle, keeping the scoreboard moving was all the Thunder needed to gut out a 95-86 win and keep its winning ways alive. “We didn’t shoot the ball well from the three-point line but we stayed with it in terms of battling defensively, contesting and we worked really hard in the game to play a good defensive game,” said Donovan.